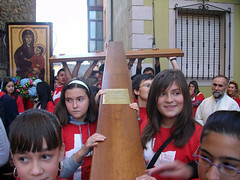 From there, the Cross, would leave in procession, being carried by young people to the shrine of the Virgen de la Encina. 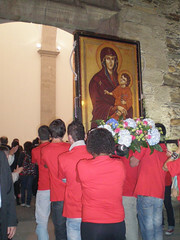 All of the events began with the procession of the World Youth Day Cross and Icon, which were preceded by other religious images of Ponferrada. Upon arrival at the Sanctuary, there was a celebration praying vespers and Bishop Camilo spoke a few words before starting the adoration of the Cross. 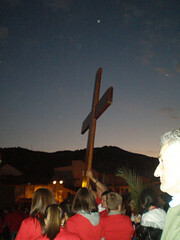 At 8:00 pm, the Cross and the Icon would come back out into the streets of Ponferrada. 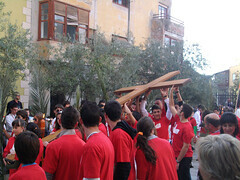 They would be accompanied by young the people who had gathered there to attend the Youth Gathering organized to celebrate the arrival of the Cross, and would arrive at Church of San Andrés. This church has just been recently restored, so that it can be used especially for youth ministry. 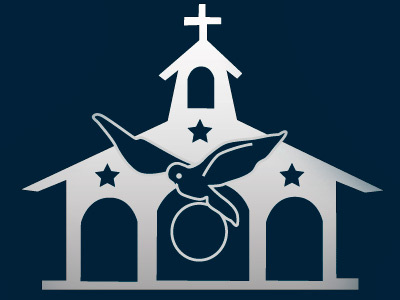 There the bishop inaugurated the new John Paul II Youth Ministry Center. Although we had planned on leaving for Fabero at 8:00 pm, the plans were delayed because we couldn't resist doing everything that we could so that all the young people who had come Fabero could carry the cross. 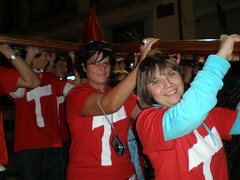 And so, along with other young people, they entered into to the Church of San Andrés carrying the Cross. At the beginning, except for one girl, the rest of the young people from Fabero had not decided to join the Youth Gathering that would take place from Saturday to Sunday, but in the end, 5 of them also decided to stay for dinner and participate in the other acts that night. We went back to Fabero in bus with the other people and we arrived at 9: 30 pm at the parish. We organized everything in 10 minutes to get the necessary things for dinner, our car, and a young mother from the parish to head back to Ponferrada. The Way of the Cross at the Castle was planned to begin at 10:00 pm. It was one of the best acts.There was a real atmosphere of prayer during Stations of the Cross, and confession was also offered. From there, the Cross went back to St. Andrew's Church where it remained all night along with exposition of the Blessed Sacrament as the various groups of young people took turns every hour to do adoration. We were there until 1:30 am, although we would have liked to stay longer. The next day, the Cross presided over the celebration of the sacrament of Confirmation of 40 young people and 20 adults from Ponferrada. It was an experience that surely has produced much fruit, especially in the hearts of the young people. At least the boys and girls from Fabero were very happy. One of the girls who returned with that night, told us that she had never imagined so many young people like that, and was eager to go the World Youth Day in Madrid.